My name is Jonathan Hoffman. I graduated from Yale, taught high school, went into business, married, had four children, and after retiring wanted to work with struggling readers. I had learned about the Orton-Gillingham (OG) approach to teaching literacy. Developed over a hundred years ago from research into visual, speech, tactile, and hearing centers in the brain, OG is a multi-sensory approach to teaching language skills. OG remains the gold standard for teaching literacy at schools which specialize in dyslexia and at some of the nation’s most selective private schools. So in 2009 I trained in OG and began my work with struggling readers. I now have over 700 hours’ experience in helping students who have dyslexia learn with this approach. Each of them has gained in mastery of phonics, reading, spelling, and written expression. I can once again put to good use the writing experience from college. And because OG presents a sensible, accessible approach to writing—building on keywords to make phrases, sentences, and paragraphs—I have helped students organize and create excellent written assignments. You might think that I work only in phonics, reading and literacy. 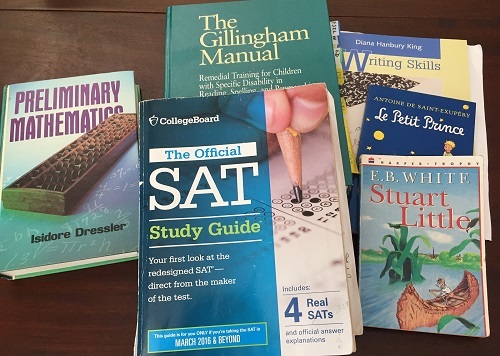 But I’ve always loved math, and because of my ability to coach in math and reading, I have enabled many students to improve their scores on the SAT and ACT. Without exception the students I have taught, from grade school through high school, have made remarkable gains in math, numeracy, grade-level performance, and test scores. From where my wife and I live in Wilmington, Delaware, I can easily meet students in northern Delaware and southeastern Pennsylvania. I regularly meet students at their homes or at the library in Bear, New Castle, Wilmington, Hockessin, Chichester, Philadelphia, Swarthmore, Media, Edgmont, and other nearby communities.